2 Masters w/Queen, 3 w/Queen, 1 w/2 Bunks, 1 w/2 Twins, Sheets & Towels Provided. This beautifully appointed cottage has all the amenities you'll need for a great vacation including 180 degree view of the lake, top floor ocean view, poolside putting green, sparkling pool, hot tub, outdoor bar area with gas grill and 2 person ocean kayak. Sleeps 16. Water views, pool area your kids will never want to leave! Bring your dog to the beach! Step out the back gate to fish and kayak on the lake or follow the sandy path around the lake to the beach. No roads to cross, safe for the kids. 450 yards to the beach. Comes to 3+ blocks along the path. Close to community tennis, tennis rackets provided. Our guests with small children particularly appreciate the pool area. (Open mid May thru Oct.). Child gates provide peace of mind, plenty of seating and activities for the whole group in one area. Intercoms on top and bottom floors, board games, books and poker set. Ground Level: Game Room w/Pool Table, Wet Bar, Bar Fridge, Microwave, Queen Sleeper Sofa and Video Game System, Queen Master Bedroom, Bedroom w/Double Bunk and Full Hall Bath. Upper Level: Lake and Ocean View, Table for 10, Counter Seating for 3, Deck w/Table for 4 (17 total), Half Bath, Flat Screen, DVD, VHS, Decks w/Patio Set, Half Bath, Living Area w/Cathedral Ceilings, Bedroom w/Queen. Loft: 4th Floor Loft w/Ocean to Sound Views, the views and privacy are exceptional. This property is convenient to the beach, shopping and grocery stores. The house is in fair condition but could use some routine maintenance (paint, minor carpentry repairs, some carpet replacement etc). The amenities provided were in many cases unusable. Example: the kayak advertised had a hole in it that allowed water in, the felt on the pool table was so wrinkled it was hard to play on, the furniture was showing it's age. Overall a nice property but needs some work and updating. We appreciate your review and are glad you had a wonderful week! Overall, our stay was pleasant. Initially we ran into several concerns upon our arrival at the house. We called the property management Monday morning and they had someone out the next day. Some issues were: the house overall not being cleaned well. There was dog hair everywhere from a previous visitor. Trash not taken out properly. A broken dining room table. The pool not cleaned. Ants in the kitchen. Door unlocked upon arrival. We traveled with an extended family, our youngest 6 months. The house was well equipped to aid in taking care of the basic necessities for the age range. It had a pack and play as well as a high chair. The pool and hot tub were enjoyed by everyone. It was a nice break from the beach when it was too hot. There were also several pool toys to play with. The putting green was a fun bonus for all ages. The walk to the beach was easy. It was less than a mile and our accompanying toddlers had no problem making the walk back and forth. We were next to the lake and the kids enjoyed seeing the turtles in the lake also. The area overall seemed safe and quiet. The kitchen had enough pots and pans to adequately cook and the grill was in good working order. Plan on bringing everything with you for cooking as there was little to nothing left behind from previous vacationers (tinfoil, ziploc bags, dry spices, garbage bags, etc). There were also books available to read and some toys for the kids. The bedrooms had adequate space and the common areas were comfortable to be in. We would probably return back in the future. We are happy to hear your family enjoyed your stay at A Sea Chalet! Sounds like your family took advantage of the wonderful location this property is in and had a memorable time. I'm glad we were able to address those issues you mentioned promptly. Thanks for posting. We look forward to your return! Thanks you for your comment. We're so happy you had a great time, and look forward to seeing you at the Beach again! The house had a few cleanliness issues when we first got there - build up of dust/grime on louvered doors, not quite clean showers/baths, but overall the house was in good shape. It is NOT an easy walk to the beach; although not terribly far, the sand path makes walking difficult, especially if you are taking a lot of gear/small children (we had a 3yr old and 4yr old). The easy access to the lake was great - we went to feed the turtles and ducks every evening after dinner. Pool was great, as was the hot tub. It would be nice to have had direct access to the pool from the top level deck, but it wasn't unbearable to go thru the house. The deck swing in the photos was not there. Very close to grocery store, ABC, shopping and water sport rentals. Overall, I would be happy to rent this location again! What an amazing time! Great house with lost of space! This was our family's first vacation together in 4 years!! My family of 6 includes my husband and I along with our children 10, 14, 16, and 20. My brother, his wife and 2 sons; 5 and 16, and our parents in their 60's. The rental was beautifully located with a pond outside the back, with a kayak provided, that the kiddos enjoyed daily. The home was very very clean!!! The 3 main levels had enough sleeping and room for everyone to gather and not feel cramped!! With the pool table on the lower level, the kids could play and have fun without the adults hearing it from the upper main level!! The kitchen and bathrooms were clean and functional and we could all shower without losing water pressure or hot water!!! We had Beautiful views from our balconies!! The only downside is the beach is about a 5-7 minute walk, which we didn't have any problems with, but my dad with his knees and being a bit older was not able to make that walk. This is the ONLY slight inconvenience of this property, but we had our own pool and hot tub, so we just hung out there!! Please take the walk to the beach to enjoy the gorgeous sunrises and sunsets; it's totally worth it!!! The kiddos would go fishing in the pond and go to the beach to crab hunt at night!! They all said this was their favorite vacation!! And that says a lot when we have such an age difference between them all!! They also loved the mini putt putt right next to the pool. The shops are all around you with a butcher and Food Lion less then 1/2 mile away!!! 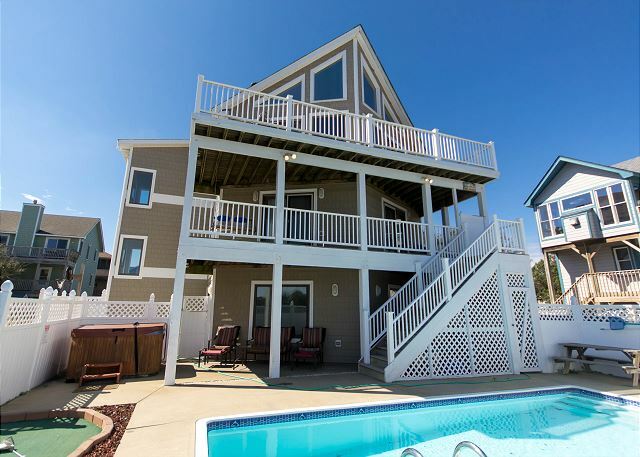 We loved Everything about the Outer Banks; this was our first time there and would highly recommend this area and this home to anyone!! This vacation was EVERYTHING I had hoped it would be; I don't get much time with all my children together in one place and I am so very glad we we able to have this time here!! We will be back next year and I thank you for making this vacation....THE ABSOLUTE BEST EVER!!! Overall great experience. The few issues were minor and normal for a rental dwelling. All questions and concerns were answered or taken care of immediately by the rental company. We are so glad you had a great time and that we were able to resolve all of your concerns! We loved the house and had a great experience. - Pool and Hot Tub were nice. Both were clean and enjoyed by all. - Kayak provided and Lake just behind house was nice. We rented paddle-boards also which was great. - Putting green at house was nice. Kids loved it. - Game room on 1st floor was nice. Pool table was good for adults. Nice TV in there and kids played Wii video games which was nice break from the sun. - This house is not a 5 minute walk to the beach access as advertised. It took adults 15 mintues to get to access walking at quick pace. It took 20 minutes when walking with kids. We ended up having to drive the smaller kids (under 5 years old) in a car and dropping them off. Also very long walk if carrying all your beach stuff. - Beach cart at house had both wheels flat. It was noted that wheels just needed air, but that only kept them inflated for about 5 minutes. Not much help when walk to beach is 15 mins or more. Suggest to bring your own wagon/cart. - The way the decks are on the back of the house you must go inside the house from 1st or 2nd floor to get up to 3rd floor. If you go in on 2nd floor you have to cut through bedrooms. Not a big issue, just no access from pool up to 3rd floor kitchen w/o going through the house. Happy to hear you had a good experience and love the cottage! We will pass the comment along about the wagon wheels and couches to the owner. This house has so much to offer and we are happy to know your family took advantage of what it has to offer. We'd love to have your family return for another fun filled vacation! Thanks for sharing. Thanks for taking the time to leave us feedback. We are glad to hear you enjoyed your stay at A Sea Chalet. We apologize for any inconvenience you experienced during your stay. All maintenance issues should be reported as soon as possible so we can coordinate repairs accordingly. The pictures do not really do the house justice. There was plenty of space for everyone in our family group (6 adults, one 6-year-old and a toddler). The kitchen was well-equipped, including myriad pots and pans as well as serving dishes. Even storage containers for leftovers were available. The baby items (toys, booster seat, pack-n-play, etc.) were extremely useful and appreciated. Pauline at Beach Realty & Construction was IMMENSELY personable, friendly, and helpful! High marks all the way around. A Sea Chalet is a beautiful cottage. We are happy to hear you and your family members enjoyed your stay! The extra amenities are a nice touch from the owner to assure the guests have everything they need for a smooth vacation. Thanks so much for sharing, we appreciate it! wonderful experience, house was in good condition. Basement flooded turning torrential rain storm.. called property management and maintenance was there the next day to help. We apologize for any inconvenience the flooding may have caused your family during your stay. I'm glad we were able to help with this issue. Thanks for taking the time to post and we are happy to know you had a wonderful experience! Hope to see you next year! Overall a nice house for a family vacation. There were a few snags though. The ant problem in the kitchen was very noticeable once open food was nearby. Also, the grill in the back (while very nice) ran out of gas after heating up. Not sure how anyone would know since there's no gauge. The beach is marketed as being within walking distance, but it's really quite far, esp. with kids. We had to caravan and make one person do the walking to get the van. Didn't consider using the beach cart with a busted tire. One more thing, the house was generally clean; however, we had our dogs with us and they managed to find tons of candy hidden in random places throughout the house (under beds, in sofa seat cushions). Thank you for taking the time to write us a review. We apologize for the issues you experienced while staying at A Sea Chalet. In the future, report any issues such as ants or concerns with cleaning, directly to your check-in office. This way we can coordinate pest control and our cleaning crews to correct the oversights. We appreciate guest feedback as it is the only way we will know of areas that we need to improve. 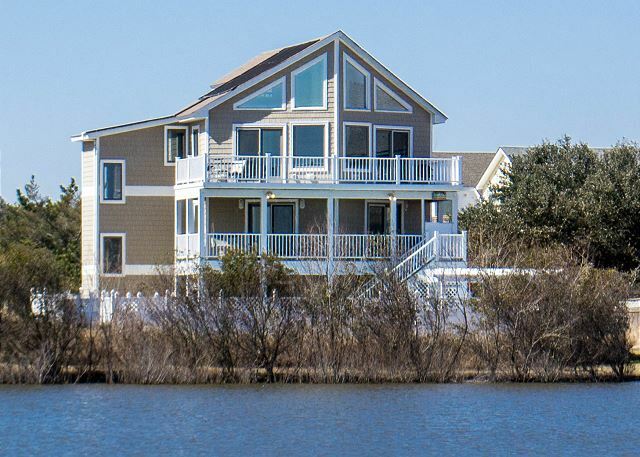 We hope you'll return the Outer Banks for your next vacation and consider KHR again.